He was thought to be the oldest man in Tokyo - but when officials went to congratulate Sogen Kato on his 111th birthday, they uncovered mummified skeletal remains lying in his bed. After tracking down the residence in Adachi, Tokyo, where Kato was reportedly living, attempts by officials to meet him were rebuffed numerous times by the family. Many reasons were given by his relatives, including that he was a "human vegetable"and that he was becoming a Sokushinbutsu. Sokushinbutsu were Buddhist monks who engaged in a process of self-mummification through diet and isolation. Eventually, Kato's body was found by police and ward officials in July 2010, when ward officials intending to honour his achievement of longevity on Respect for the Aged Day later that year were again rebuffed and police broke into the house. Found in a first floor room, Kato's mummified remains were lying on a bed wearing pajamas and were covered with a blanket. Newspapers that were found in the room dated back three decades to the Shōwa period, suggesting that Kato's death may have occurred around November 1978. An official named Yutaka Muroi said, "His family must have known he has been dead all these years and acted as if nothing happened. It's so eerie." The day after the visit, Kato's granddaughter told an acquaintance that "my grandfather shut himself in a room on the first floor of our home 32 years ago, and we couldn't open the door from the outside. My mother said, 'Leave him in there,' and he was left as he was. I think he's dead." One official had reported concerns about Kato's safety earlier in the year to his ward office. An autopsy failed to determine the cause of Kato's death. Following the discovery of Kato's body, two of his relatives were arrested in August 2010, and subsequently charged with fraud. Prosecutors alleged that Michiko Kato, 81, Kato's daughter, and Tokimi Kato, 53, his granddaughter, fraudulently received about ¥9,500,000 ($117,939; £72,030) of pension money. In addition, after Kato's wife died in 2004 at the age of 101, ¥9,450,000 ($117,318; £71,651) from a survivor's mutual pension was deposited into Kato's bank account between October 2004 and June 2010. Approximately ¥6,050,000 ($75,108; £45,872) was withdrawn before his body was discovered. Kato was likely paid a senior welfare benefit from the time he turned 70, which the family may also have used to their advantage. Investigators said that the pair defrauded the Japan Mutual Aid Association of Public School Teachers, who transferred the money into Kato's account. In November 2010, the Tokyo District Court sentenced Tokimi Kato to a 2½ year sentence for fraud, suspended for four years. Judge Hajime Shimada said, "The defendant committed a malicious crime with the selfish motive of securing revenue for her family. However, she has paid back the pension benefits and expressed remorse for the crime." It's a fake story, she is Xin Zhui lady. a Chinese women died 2,000 years ago. 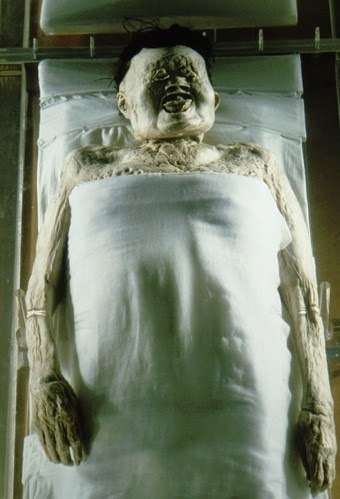 The picture of the mummy might be fake for this story (the mummy is Xin Zhui as you say), but the story about Sogen Kato is very much real, look it up before you call it out as being fake.